The current version has a couple of things for you in store. 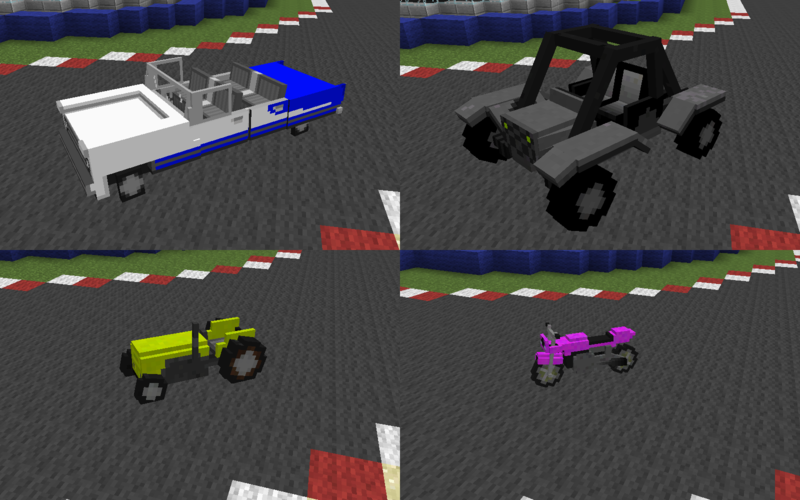 It currently features 4 vehicles, an Oldsmobile style car, a tractor, a dunebuggy styled car and a motorcycle. 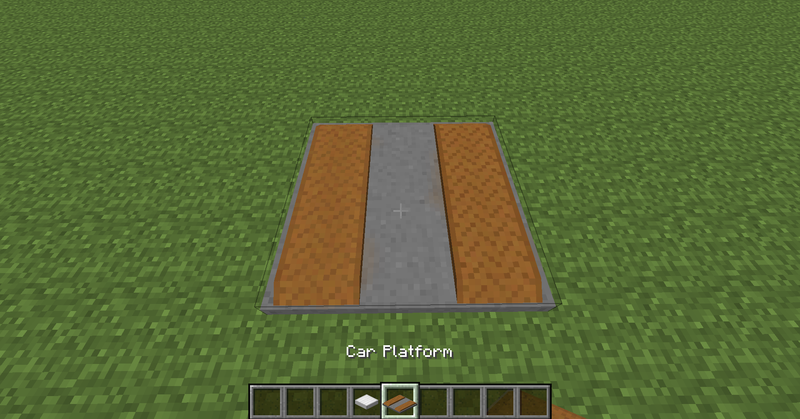 All 4 vehicles can be crafted with a car platform, which in turn can be crafted by building a 3x3 grid of iron pressure plates, but leaving the middle one empty. 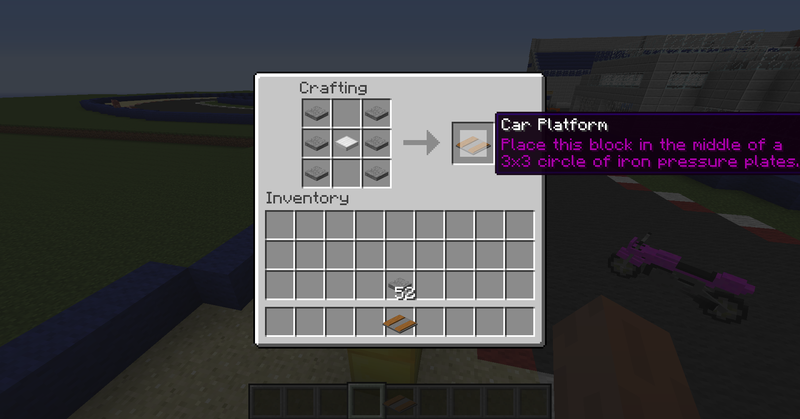 Then you craft the car platform itself with 6 stone pressure plates on the sides and 1 iron pressure plate in the middle and put that down in the circle of iron pressure plates, it will turn into a 3x3 car platform. After you've crafted the car platform you can right click it to bring up the car crafting window, which will allow you to choose which car to craft and show you the materials needed to craft it. Each car features 5 stages of crafting, Chassis, Wheels, Engine, Electronics and Dye. The crafting progress will be visible on the bottom of the car crafting window, and the items needed to finish the current stage will also be visible. When a car is created one can right click it and take it for a spin, every car handles differently and every car has a different hitbox. When a car is broken, it will drop a receipt, this could be seen as your insurance and will allow you to respawn the car at any car platform. In creative mode cars can be spawned by right clicking with a receipt. Vehicles have a handbrake (Default Left ALT) and a Horn (Default H) and they make sounds when driving. As a last note, the mod does currently allow you to actually create your own vehicles, but since the mod is in Beta I've yet to make a tutorial on that. Custom content will be the future for this mod though. This is still a beta mod, so there might be some bugs. Chances are it will actually crash your game. If you do encounter bugs, please report them to me so I can improve the mod! For version 0.1 of this mod no Forge versions higher than 10.13.4.1448 can be used. but leaving the middle one empty. and show you the materials needed to craft it. The roads, markings and traffic lights used in this video are from my other mods, which are also available on this forum. 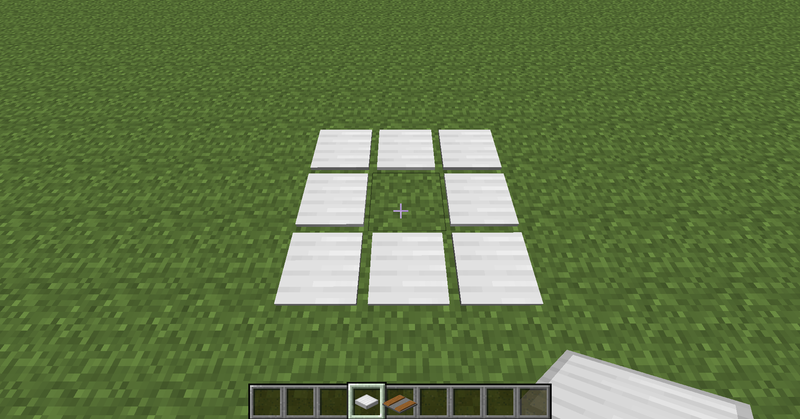 When doing a full 360 degree spin, the vehicle will correct itself to 0 degrees (So the number will never get too high for minecraft to handle) for some reason it animates this and you might see the car do a spin. When placing vehicles in Multiplayer, sometimes a Ghost copy appears. Forge versions higher than 10.13.4.1448 deliberately crash the game, a new way of adding cars has to be implemented because the zip/jar file must be extracted for the mod to work right now. Car hitboxes are very strange because of Minecraft's standard hitbox handling, plans are there for implementing hitboxes per wheel specifically. Rockstar games, for creating the vehicles I remodeled (and renamed) mine after. Flan's mod for pioneering on this subject (No code has been used).